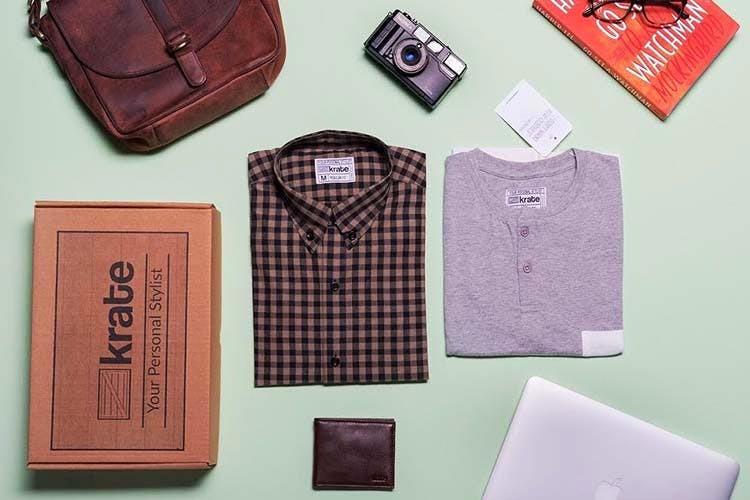 Krate is a subscription box service for guys that sends you a box of clothes every month that's curated by their in-house styling team. Saving time when it comes to shopping, casuals, shirts. If you're somebody who doesn't like going out and scouring the malls and the stores for clothes, or just has a general wave of indecision going when it comes to buying clothes, Krate's going to be treat for you. They have a subscription box service where they send you a box every month with a mix of clothes based on your style choices, preferences and size—you take their Style Quiz for that and choose between casual, trendy, formal, or a mix. The box will have 2-3 items (like two shirts, one shirt + one pair of jeans, or two tees + one pair of jeans) ranging from Henleys and shirts to jeans and chinos. We have our eye on their printed shirts and Henleys—they look like great additions to any wardrobe. The box is priced at INR 1,499 (plus taxes) per month. Since somebody else (their stylists and software) chooses the clothes for you, there's bound to be a mismatch here or there. Also, they don't currently accept any returns, just exchanges. Select the type of clothes you like in the 'wishlist' section; Krate will design and send you clothes based on those preferences.